Over the span of two years the Global Commission on Internet Governance has helped to educate the wider public on the most effective ways to promote secure Internet access, while simultaneously championing the principles of freedom of expression and the free flow of ideas over the Internet. Below is a short review of the Commission's impact in advancing debates about the the future of the Internet. The Commission's work has impacted the way that the public, media, and governments around the world see the issue of Internet governance. Some of the Commission's latest mentions in the media include: Reuters, BBC Click, Politica Exterior, UAE The National, Huffington Post, Project Syndicate and Open Canada. The work of the Global Commission and the launch of it's One Internet report at the 2016 OECD Ministerial Meeting was covered widely in international media, and helped frame timely discussions around cybersecurity, free speech, and internet fragmentation. The Global Commission's One Internet report was launched in various locations around the world. During these launches the Commission's executive met with senior policymakers and members of government to discuss key issues emerging in cybersecurity and internet governance. The Commission's work and final report received praise from a variety of policy makers and governments around the world, such as former US Secretary of Commerce Penny Pritzker, Deputy National Security Advisor for the Government of India, Arvind Gupta. 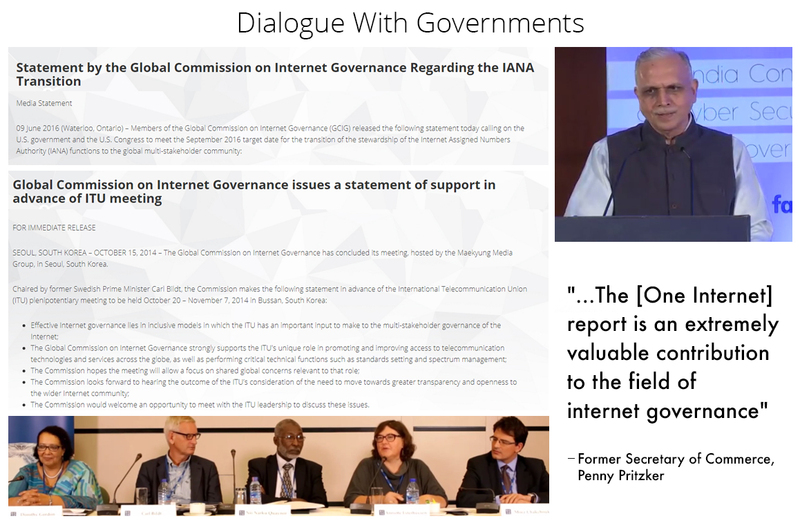 The Commission`s research also fed directly into key issues in internet governance, such as the IANA transition. In July 2015, key elements from the Global Commission on Internet Governance’s call for a new global social compact on digital privacy and security were presented to UK Prime Minister David Cameron, through a new report by the Independent Surveillance Review. The Commission's work represents the single largest body of research on Internet governance, encompassing over 47 research papers, several books, and six research volumes. Informing the Global Commission's research was public input from three extensive public-opinion surveys conducted by CIGI and the global polling firm Ipsos on different aspects of Internet trust and security. The CIGI Ipsos Survey was conducted in 2014, 2016, and 2017.